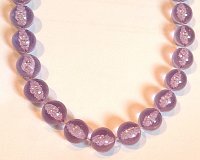 Amethyst 920mm long polished semi-precious stones Necklace. Aquamarine polished free form shape semi-precious stone beads 920mm extra long string. Semi precious Garnet gemstone necklaces 920mm length highly polished free form shaped stones string. Malachite chips gem stones tumbled necklace endless string 920mm long beads free form shapes and sizes Dark Green Malachite semi precious stones. Fire Moonstones semi-precious moonstones string of tumble polished beads. Semi precious gemstone necklaces 920mm length in highly polished stones. Stunning Pink Rose Quartz semi-precious gemstones in random polished shapes on extra long 920mm string Pink Quartz beads. Turquoise colour stones in extra long 920mm string of free form tumble Polished bright Tuquoise light Blue colours Necklace. Turquoise coloured Extra Long 10mm gauge plastic beads string, 1200mm length. Large 14mm wide round plastic Clear look Purple tinted large 760mm long Bead Necklace. Oval disc shaped Fashion expandable bracelets (Pack of 3). 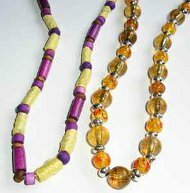 Bead discs and antique metal look discs bracelets with wood and autumn look coloured beads. Pack of 3 Antique look double beaded fashion bracelets. (colours supplied assorted and may vary from image brown, fawn, blue, red etc). Vintage design wide double bead and antique metal look bracelets (Pack of 3). Pack of 12 assorted Fashion Necklaces, selection can include Pendants on cord, Wood Beads, Ethnic design jewellery, Traditional Beads etc. various. Hematite Beads approx. 4mm x 4mm barrel shape Hematite Beads. 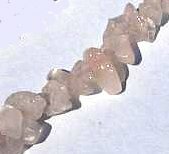 Supplied loose as a Strand of approximately 410mm (16inch) length of beads.